Our newest website, www.polelinefasteners.com contains educational information related to pole line fasteners. These fasteners are used to attach crossarms to utility poles and various electrical components to those crossarms. Created by our resident pole line fastener expert Anthony Porreco, this microsite contains technical information about headed bolts, rods, bent bolts, nuts, and plates, all of which are used in the pole line industry. We have created this technical resource for engineers, PUD’s, crossarm manufacturers, electrical contractors, electrical distributors, and fastener distributors. The technical info section of this site will provide just that, technical information related to pole line fasteners. The FAQ section of the site will address many common questions related to pole line fasteners. Because all pole line fasteners are exposed to the elements, these fasteners are always hot-dip galvanized to prevent corrosion. Therefore, another section of the website provides technical information about the galvanizing process. How do we know so much about hot-dip galvanizing? We do it ourselves! Contained within our 85,000 square foot bolt manufacturing facility is our very own hot-dip galvanizing line that is designed specifically for threaded fasteners. By controlling the galvanizing process in-house, we are able to quality check each fastener that comes off the galvanizing line as well as meet your critical delivery requirements.Do you have questions about bolts for a pole line application, require a quote, or need to procure pole line fasteners for your project? If so, contact Anthony. Q. Do torque charts for tensioning fasteners apply to anchor bolts? For more information on torque as it applies to the installation of anchor bolts, read the complete FAQ. In the winter of 2012, Portland Bolt was chosen to supply overhead catenary system anchor bolts for the SANDAG Blue Line Crossover and Signals Project in San Diego, California. 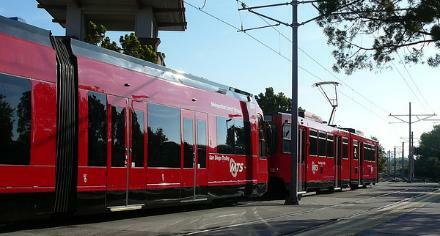 Our customer upgraded 15 miles of the existing Blue Line from downtown San Diego to San Ysidro in California. We manufactured 31,000 pounds of 2″ and 2-1/2″ diameter F1554 grade 55 anchor rods complete with welded flat bar anchor plates. Our anchor bolts support the light poles on this line as well as the poles that carry the electricity to power the light rail vehicles. Read more. Have you ever struggled to get nuts on your galvanized bolts because there is excess zinc in the threads? Have you received bolts with chased threads, a common practice not allowed under ASTM specifications in which galvanized bolts are re-threaded to remove excess zinc? If so, Portland Bolt can remedy the common problems you may be experiencing with galvanized fasteners. Portland Bolt is the only company that we know of in the United States that not only manufactures a full line of construction fasteners including anchor bolts and headed bolts, but also galvanizes them within the same facility. Hot-dip galvanizing is a process in which bolts are immersed in 840° molten zinc that bonds to the steel to form a corrosion resistant coating. This galvanizing method is advantageous, because the zinc actually penetrates into the surface of the steel to form a much more corrosion resistant coating than either mechanically galvanizing or zinc plating. Our hot-dip galvanizing line is specifically designed for threaded fasteners, allowing us to control the delivery schedule and ensure a quality corrosion resistant coating. The bottom line is that threaded fasteners can be a challenge to galvanize, and most large-tank galvanizers that other fastener manufacturers use to galvanize their bolts simply do not have the equipment and systems in place to properly eliminate excess zinc from the threads of fasteners. Portland Bolt uses a high-speed centrifuge to spin the excess zinc from the threads immediately after being removed from the zinc before it has a chance to solidify. We inspect all bolts as they come out of the galvanizing tank to make sure they will accept nuts, preventing installation nightmares in the field.